How can a divorce mediation in Orange County help me? How are temporary restraining orders enforced in OC California? Do I Need an Attorney for a Separation Agreement in Orange County? FAQ: How can a divorce mediation in Orange County help me with my divorce? When it comes to family law issues in California, disagreements are the reason that families end up in court. Mediation is one way that some family law issues can be resolved outside of court while still leading to a legal agreement that both parties have worked out together before a judge sees it. Mediation is not right for every single family, but a large majority of cases can be worked out through mediation, allowing families to avoid spending hours in a courtroom. So, what is mediation? 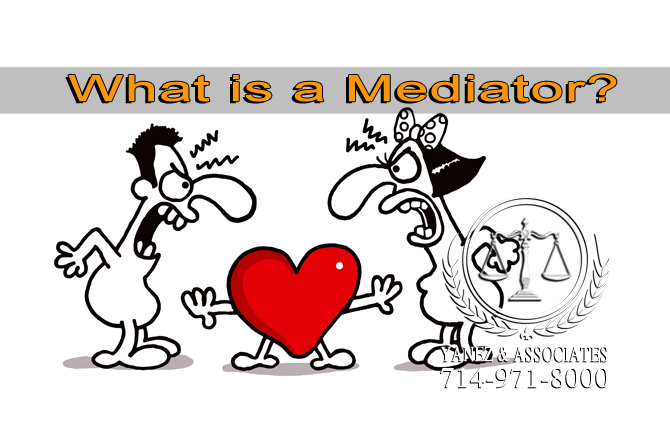 What is a mediator? How does mediation work, and why would a California family choose to use it? There are many common questions about mediation, and we’re here to answer some of them for you today. Remember that while online research can help you understand mediation; the best way to understand how mediation can help your family law situation is to discuss your issues with an Orange County family mediation attorney. What is Mediation and is it for me? What is Mediation and will it work for my family law case? Mediation is a process that takes place outside of a courtroom that allows two opposing parties to come to a mutual agreement on specific, designated issues. Their discussions are facilitated by a trained mediator, and mediation sessions are generally informal. In California family law cases, mediation sessions are private and confidential, and while both parties are encouraged to discuss their options with a private attorney outside of the mediation sessions, neither party can have an attorney present during negotiations. The goal of mediation is to allow both parties to set and reach their goals regarding their current legal issues. This can include issues relating to children in a divorce, like child custody. Through mediation, parents can work together with the mediator to create a parenting plan that follows the California custody laws, allows the child to spend time with both parents, and in some cases, even improve communication between two parents who share a child, but are no longer in a relationship with one another. Unlike when a judge makes a decision for a family in a courtroom, mediation allows the two parties to make decisions for themselves. Mediation not only takes the law into consideration, like a judge would, but it also allows them to consider their own personal needs and wants, and create an agreement that works well for both parties. If mediation does not work, usually, both parties can choose to go to court and have a judge make decisions on their behalf. How do mediators help families who may be at odds with one another to create common goals, and come to mutually agreed solutions. A mediator is the person who oversees the mediation process. The mediator facilitates healthy discussion. He or she must remain neutral throughout mediation, and is forbidden from providing legal advice to either party. A mediator cannot be called into court during any case related to the current mediation or used as a witness on behalf of either party. A mediator’s main goal is to help with communication between the two parties. He or she will assist in both parties communicating with one another, understanding the ideas, thoughts, needs, and wants of the opposition, and find strengths and weaknesses in both cases. He or she may suggest options for a resolution that both parties could be happy with. Mediators also go through specific training before becoming mediators. They learn to help families who may be at odds with one another to create common goals, and come to mutually agreed upon solutions. Often, in family law, mediators are, or once were, professionals in the mental health industry or the legal industry. Attorneys can also be mediators. If, however, you hire an attorney to be your mediator, both parties must find attorneys who are not affiliated with the mediator to act as their individual lawyers. The benefit to finding a mediator who is also a lawyer, or one who has previous experience in the law, is that they will be able to better guide you to create an agreement that is in line with the law in California. They may ask specific legal questions that a mediator who does not have a legal background would not have thought to ask. 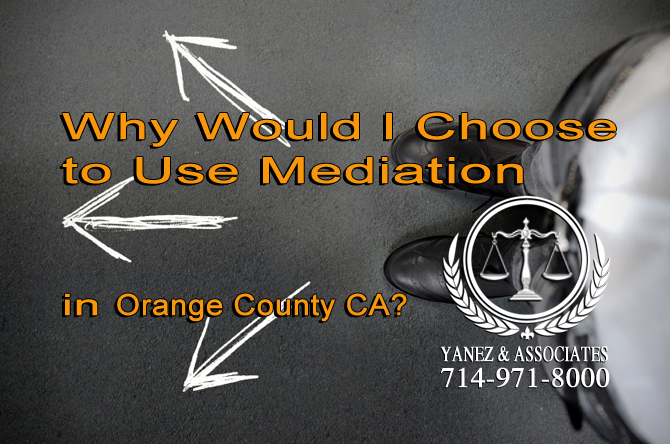 How Does Mediation Work in Orange County CA? How Does the Mediation Process Work ? Mediation is a legal process. 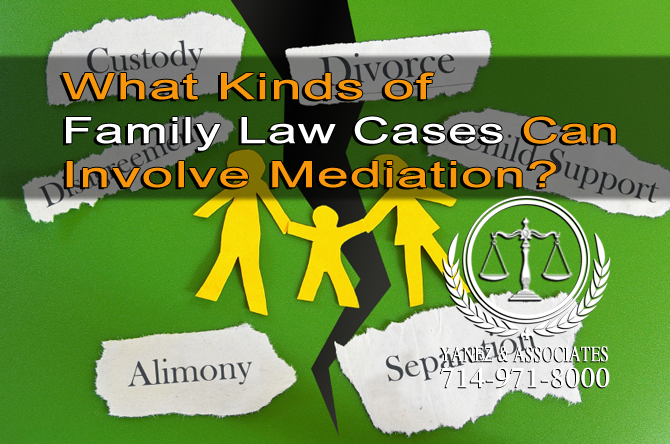 Sometimes, a family may choose to use mediation before going to court. Sometimes, the court may choose to order mediation before considering making a decision for you. Mediation usually starts with the mediator asking both parties, individually, to explain their side of the story. Then, the two parties can meet with the mediator together. During the first meeting the mediator will usually help the two parties to create common goals. These can vary from ‘creating a parenting plan’ and ‘dividing the debts’ to more specific goals like ‘deciding who gets to keep the dog’ and ‘deciding which parent will get sole custody when one parent is moving away’. A mediator can then write those goals down, creating a mediation agreement. Both parties can sign this agreement that states what they want to get from mediation, and have a copy of it. This is a great thing to show your attorney outside of mediation before you sign. Throughout the process of mediation, the mediator will help the couple come up with solutions to their problems and find ways to resolve the issues discussed in the mediation agreement. This may require the mediator to meet with both parties together, or each one individually. Mediation ends either when both parties come to an agreement, or when they decide that an agreement is not going to be reached. Remaining issues can be brought to court, and the mediator cannot reveal any part of mediation during trial. If an agreement is reached, or if a partial agreement is reached, an agreement can be drawn up, both parties can have their lawyers look it over, sign it, and the mediator can submit it to the judge for approval. Why Would I Choose to Use Mediation? Why Would I Choose to Use Mediation are there any benefits? 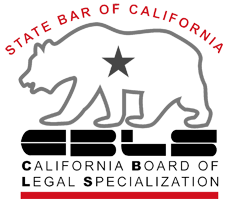 There are numerous benefits to mediation in family law cases in California. Mediation usually allows both parties to save money and time over going to trial. Hiring one mediator and consulting with two attorneys outside of mediation is usually less costly than hiring two, full time attorneys. Mediation also allows the two parties to work on their schedules, assuming the mediator they find can be flexible, rather than working around the court’s schedule. Mediation takes as much or as little time as the two parties want it to take. Mediation allows the two opposing parties to have a say in their own agreements. This means that they are more likely to understand it, and it is more likely to be tailored to their unique situation than if a judge had made the decision for them. Parties are more likely to be happy with the outcome of mediation than the result of a trial. In cases where children are involved, mediation allows families to keep the children out of legal battles, and out of the courtroom. Cases that go to trial may create extra stress on children, especially if they have to appear in court. Mediation can often help to build, repair, or preserve relationships between parents, couples, and more. The process of mediation forces two opposing parties to work towards a solution together. This relationship boost can be especially beneficial in separations, cases where parents share a child, and cases where two people run a business together after a divorce or separation. What Kinds of Family Law Cases Can Involve Mediation? Will divorce mediation include all family law issues such as, divorce, custody, support and visitation? All kinds of family law cases can involve mediation: divorces, legal separations, child custody and visitation battles, child support cases, partner and spousal support cases, property division, debt division, asset division, and more. However, mediation is usually not a good idea when it comes to any case that involves domestic violence, abuse, restraining orders, or protective orders. In these cases, mediation can be dangerous for one party, and can cause abuse and violence to continue. Who can I ask for help in locating a good Mediator in my city or county? 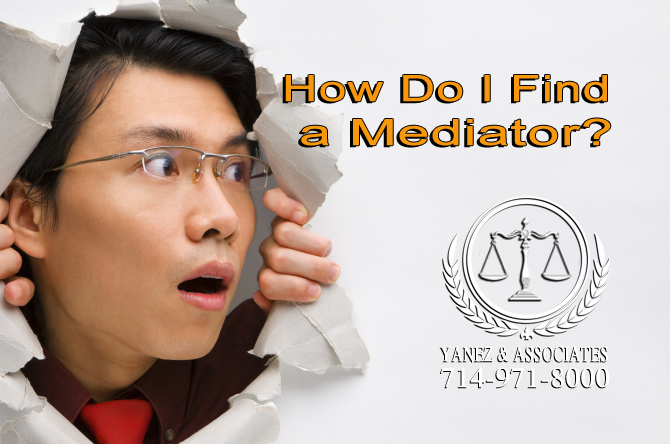 If you are looking for a mediator, try asking an attorney! Lawyers make excellent mediators, especially because they understand the law. If you already have a lawyer for your case, he or she may be able to suggest other attorneys who are good mediators. If you know someone who has previously hired a mediator, he or she may be a good person to ask for reviews. 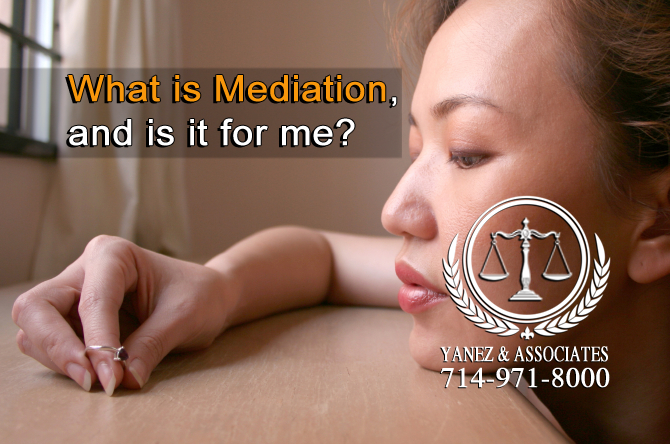 In Orange County, you can also find mediators online. If you have any questions about mediation, remember that talking to an attorney is always your best option. Lawyers can help you understand the law, how it applies to you, and how you can get started finding what you need - especially if what you need is a trained mediator. At Yanez & Associates, we have experience working on all kinds of family law cases, and we have helped clients through the mediation process. No matter what your family law case involves, from divorce to child custody and beyond, mediation is a great option and it may be right for you. Contact us today to schedule a free initial consultation with an Orange County mediation lawyer. 2 What is Mediation and is it for me? 4 What is a Mediator? 5 How Does Mediation Work in Orange County CA? 6 Why Would I Choose to Use Mediation? 7 What Kinds of Family Law Cases Can Involve Mediation? 8 How Do I Find a Mediator? Divorce Mediation, divorce mediation orange county, Divorce mediation Orange County CA, How Do I Find a Mediator?, How Does Mediation Work in Orange County CA?, Orange County Divorce Mediation Attorney, Orange County Divorce Mediation Lawyer, Orange County Mediation Attorneys, orange county mediation lawyers, What is a Mediator?, What is Mediation and is it for me?, What is Mediation?, What Kinds of Family Law Cases Can Involve Mediation?, Why Would I Choose to Use Mediation?